Owners were pleased with the simplicity of operation (“ It doesn’t get much easier,” says About.com), the quality of espresso, and the ease of cleaning up. The Vienna does have a removable brew group which can be easily rinsed. In one cycle, the Vienna grinds, tamps, and brews gourmet coffee. The pump driven steam and hot water wand has an attached exclusive Pannarello device for frothing milk simple. 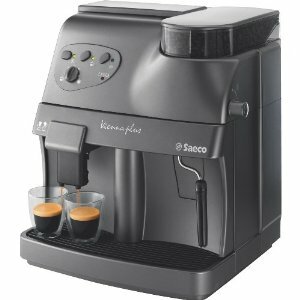 The unit has an integrated, adjustable conical burr grinder makes the perfect grind for gourmet coffee. It also dispenses hot water for making hot drinks and soups. What didn’t owners like? Some commented that they did not care for the ABS plastic case. A few reported average customer service. Overall, however, a strong performer at a most competitive price.